Click here to find out about our workshops! We help people integrate the practical and theoretical aspects of equitation and guide them towards a better understanding and enjoyment of their horses. Wherever people are starting from, and wherever their aspirations lie, our goal is to empower and enable them to communicate with their horses with absolute clarity whilst using the least amount of pressure possible, whether physical or psychological. Not exactly “on the bit”! When we were endorsed by Kelly Marks in 1998 to run Intelligent Horsemanship Riding Clinics, we originally intended to concentrate solely on ridden work. However, we have found that being able to incorporate ground skills seamlessly into our work, and into some riders’ skill sets, enables us to make lasting and significant improvements for the horse and rider, both in and out of the saddle. So after experimenting with various specialised groundwork clinics, and riding clinics, we’ve come to the conclusion that it’s not really necessary to separate them , but best to integrate the two into a single package. During a clinic, we can cover whatever is currently most appropriate for the horse and human combination. This might be riding, leading, loading, long-lining, stable manners, standing still to mount, or in-hand work. Participants might choose to concentrate on a specific skill, or might look at a variety of different areas. 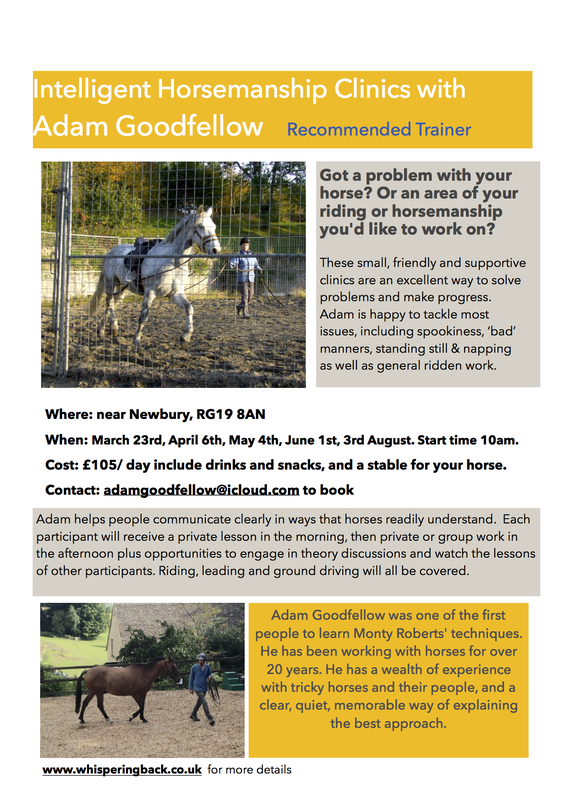 In addition, we can advise on other areas that may be having an adverse impact on the horse – saddle fit, foot balance, nutrition, or environment. There is no need to decide in advance what to work on, as we operate a very flexible structure.